While most people prefer progressive lenses to bifocals nowadays, for some people a bifocal with a line will still be a better choice. A lined bifocal is really two lenses. 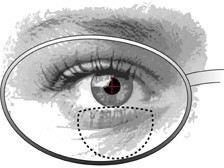 The top lens is generally set for distance vision and the bottom lens of the bifocals is usually for near. However, this doesn’t necessarily have to be the case, as bifocals can be set for different tasks. For example, bifocals can be made with the upper portion for intermediate distance while the bottom portion of the bifocals is for near. Bifocals may be a good choice for you if you have not been able to adjust to progressive lenses after repeated attempts, and you are comfortable wearing bifocals now. Some people have difficulty adjusting to progressive lenses. Though progressive lenses have improved greatly just in the last few years with the advent of freeform lenses and digital processing, there still is an adjustment period to either bifocals or progressive lenses, so it is important that no matter which choice you make, you understand the pros and cons of the lens you choose. The chief advantage of bifocals is that because there are two complete and separate lenses, you will not have the peripheral distortion that some people notice out of lower-quality or poorly-fit progressive lenses. Additionally, because there is a line between the lenses, it will be quite clear whether you are using your distance or near lens. The factors that create the advantages of bifocals also cause their disadvantages. Because there are two separate lenses, you only get two distances. Namely, near and far, and not much in between, this can be a problem when trying to read things in that intermediate distance. Also, because there are two separate lenses, there is a “jump” in the images (this is due to prismatic effects of the different powers of the lenses) when changing your vision from near to far or far to near in bifocals. Because of the smooth progression of power change in progressives, this image jump is not present in the same manner as with bifocals. Of course, there is also the line, which many people find less cosmetically appealing and another reason some people choose progressives over bifocals. Whatever your choice, bifocals or progressives (or multifocal contact lenses, monovision Lasik, etc). Our main hope and goal is that you are happy with your vision and glasses, and that they work well for you and your lifestyle.